This Hat was actually a challenge to route, but I managed it at the 4th attempt. I am quite happy with the result as well. 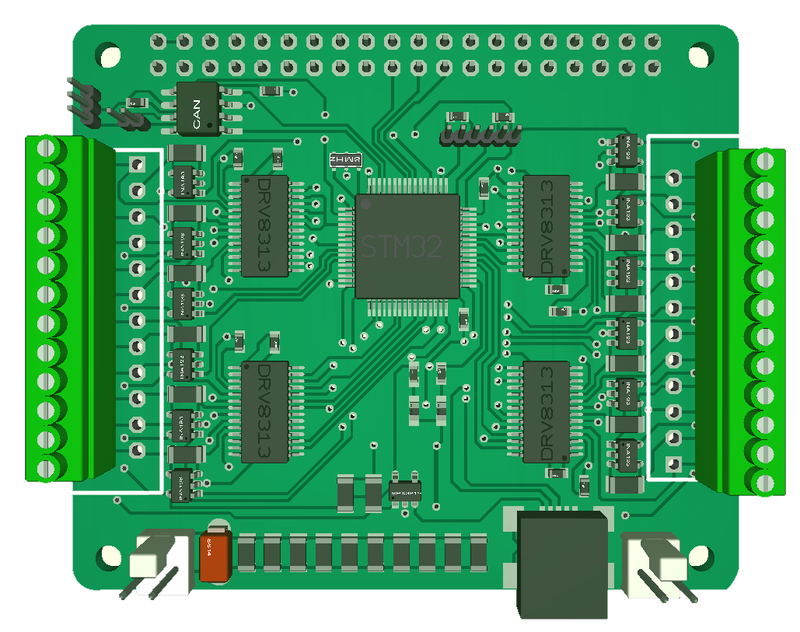 STM32F405RG MCU, 32bit ARM M4, 168Mhz, 1Mb Flash, 196Kb SRAM. 42Mbps backbone network. ca 30Mbps With Raspberry PI. 12 x separate PWM signals, ca 1A each. 24V design capable to support 48V with some cap/diode changes. 24 connector terminal block with 12 signals and 12 ground connections. 12 separate Half H-Bridges allowing a very flexible usage. Based on DRV8313 3 x Half H-Bridge Driver. I have many designs, but the flexibility of this one is in a category of itself. Running DC Motors/PWM signal up to 10A by combining ports. I must also admit that it feels good to be finish with this after so many failures on routing this very design. I have done many weighted compromises here, so I will need the MCU on this one, but it will be fun!